This is one of those classic albums that is so well-known, but for all the right reasons. There is no pop hit on this album that might bring the casual listener to it, like Big Yellow Taxi on the earlier Ladies Of The Canyon. It’s hard then to decide what is the hit and what is the hidden gem on this album. I’d say All I Want has to be the hit. As the first song, this really says ‘Blue’ to me, more than any other song on the album, even the titular song. For a hidden gem on the album, I could pretty much choose every track. I’ve opted for California as I really like the super-slow fade-out at the end of the song, with Mitchell singing against Sneaky Pete Kleinow’s pedal steel guitar (Stephen Stills and James Taylor also play on the album). Blue was introduced to me through the first series of the Classic Albums TV programme, and it’s remained a favourite ever since. I prefer it to Ladies Of The Canyon as it works much better as one whole piece of work. Whereas Ladies Of The Canyon exists as a collection of songs, Blue is more cohesive with a number of themes that run throughout the album. The style of guitar playing she employs in All I Want and Carey are also highlights for me. For some reason, listening to this reminds me of driving over Snake Pass, between Manchester and Sheffield. It’s funny that music does that. I’m presuming I was listening to the album during that journey once, and then on a repeat trip my subconscious reminded me of the association and I played it again, further cementing the connection between the two. 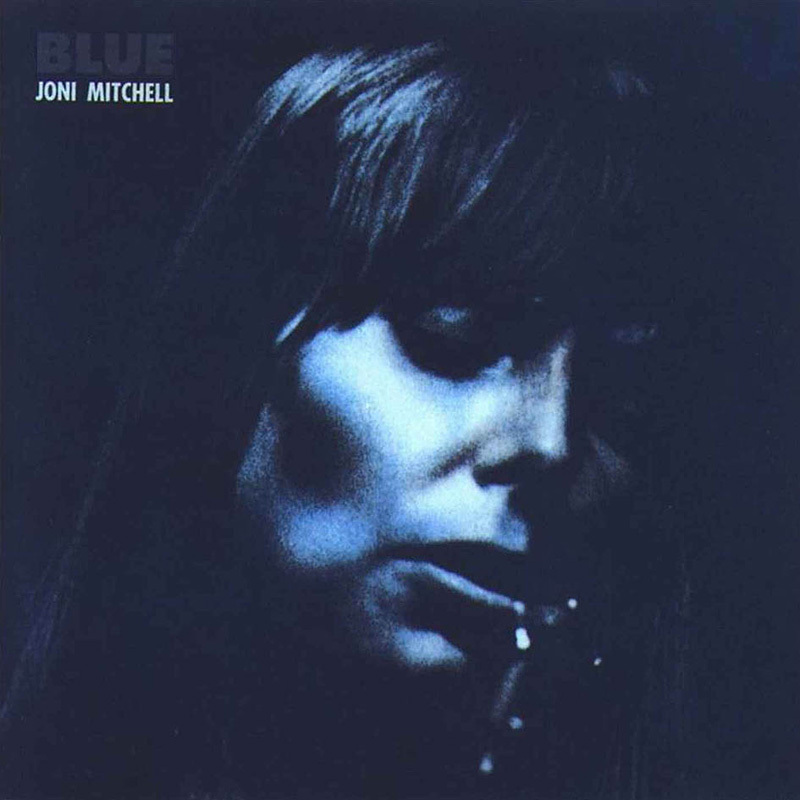 This entry was posted in 1971, Joni Mitchell and tagged Blue, Classic Albums, Ladies Of The Canyon, Sneaky Pete Kleinlow, Stephen Stills, vinyl on August 27, 2012 by mrjohnnyandrews. The second Bond film, and John Barry’s first full soundtrack (he had only arranged and conducted the James Bond Theme for Dr. No), this is where the music starts to become a key part in the Bond story. Barry’s brass-laden scores are an integral component of the Bond ‘sound’ and this comes fully formed here, ready for the global spotlight that would be cast on the series during the release of the next film, Goldfinger, one year later. From Russia With Love is clearly one of the better Bond films, if the not the best one outright, and the soundtrack is notable for the first appearance of the instrumental theme 007, which scores the gypsy camp fight scene in the film. Considered to be the ‘secondary’ James Bond theme, this pops up in several films during Sean Connery’s tenure; and only once since, in 1979’s Moonraker starring Roger Moore. The vocal version of the film’s title song, sung by Matt Munro, is one of my favourite Bond songs – and it always amuses me to change the word ‘Russia’ to ‘Rusholme’, changing the tone of the song quite considerably from the subject matter of espionage, to a simple love song about a man bringing a curry home for his wife. 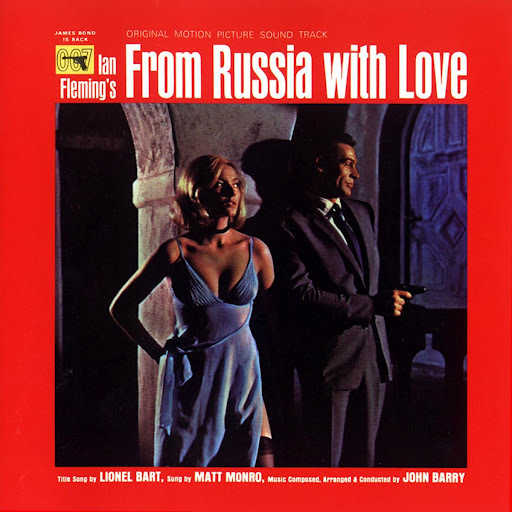 This entry was posted in 1963, John Barry, Soundtrack and tagged From Russia With Love, Goldfinger, James Bond, Roger Moore, Sean Connery, Soundtrack, vinyl on August 27, 2012 by mrjohnnyandrews. For me, and I’m talking about the international version of the Dirty Deeds album, this is where AC/DC really start sounding like AC/DC. The High Voltage album (again, to take the international release as gospel) sounds like a band searching for their sound, and I guess a few of the songs included here don’t really fit with the AC/DC template – or at least not as much as other songs on the album. A lot of people don’t like it, but I really like the cover to this album. Designed by Hipgnosis, it’s essentially a stock photo of an American motel, with a range of random everyday people superimposed in the foreground. Those people, for no reason explained anywhere on the cover – or even in the title of the album – have their eyes blanked out with black bars. To make it even stranger, there is a Doberman amongst the crowd, and he doesn’thave a black bar across his eyes. Go figure. The real gem of this album is Ride On– a slow blues, and for me a career highlight which they never came close to matching. I’d compare it to Since I’ve Been Loving You (from Led Zeppelin III) in that in both cases, the respective bands have endlessly tried to replicate these songs on subsequent releases without reaching those peaks again. 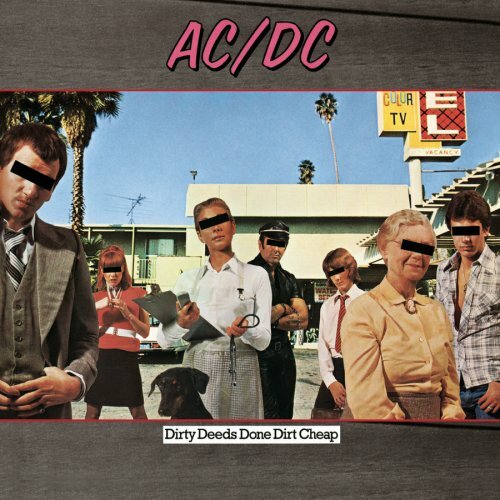 This entry was posted in 1976, AC/DC, Led Zeppelin and tagged Dirty Deeds Done Dirt Cheap, High Voltage, Hipgnosis, Led Zeppelin, Led Zeppelin III, vinyl on August 27, 2012 by mrjohnnyandrews. This is another throwback to my days DJing in and around Manchester. When I started DJing on Friday nights at 38 Bar / The Castle in Oldham, I initially wondered how I was going to fill so much time, from 7:30pm to midnight every week. I’d heard that a friend of a friend, Danny Buckley – who we would rechristen Danny Beetle – was an aspiring DJ, so I roped him into playing for an hour or so each week. It was probably very good for me that I did this. Danny opened my ears to many different types of music that I never would have unearthed myself. One such example is Dance To The Drummer’s Beat, by the ‘70s Miami band Herman Kelly & Life. This track really grooves, punctuated throughout by an overdose of cowbell which, to borrow a phrase from the liner notes, sounds like a ‘beautiful, twitching, ticking musical time bomb’. 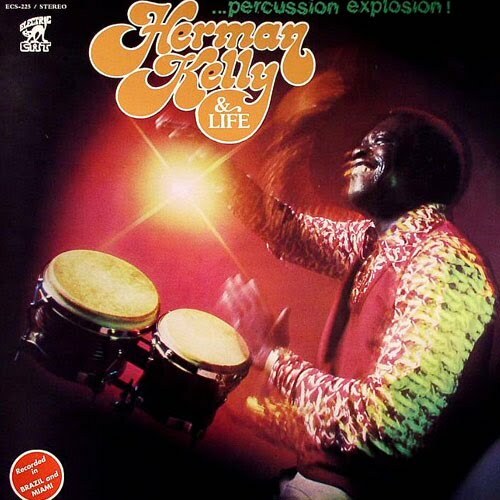 This entry was posted in 1978, Herman Kelly And Life and tagged Danny Beetle, Oldham, Percussion Explosion, The Castle, vinyl on August 27, 2012 by mrjohnnyandrews. Shouldn’t a U2 tribute act actually play U2 songs? What’s the point otherwise? 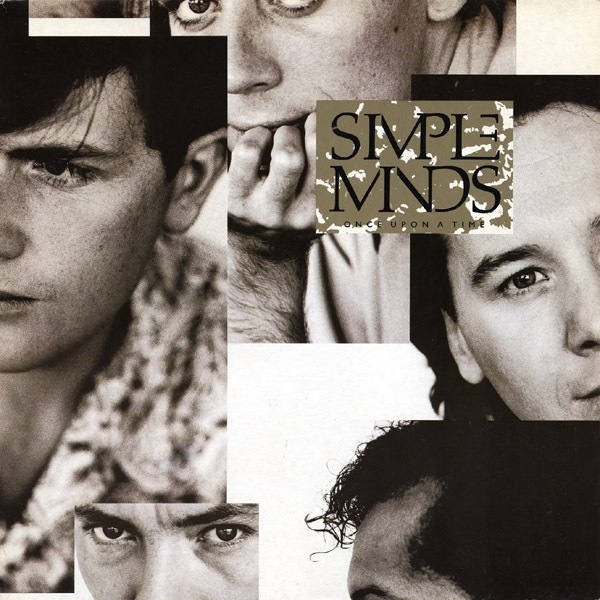 This entry was posted in 1985, Simple Minds, U2 and tagged Once Upon A Time, vinyl on August 27, 2012 by mrjohnnyandrews. I recently watched Under African Skies, the documentary about the recording of Graceland which has been touring the film festival circuit over the past 18 months or so. The film marks the 25th anniversary of the album’s release, and has the usual talking heads interspersed with archive footage from the recording sessions. One of the big talking points was Simon’s stealthily assembled recording sessions in South Africa, bypassing the cultural boycott of the country imposed by the ANC. It’s funny that the music industry often criticises Queen for playing concerts in South Africa at this time (a topic that really annoys Brian May when brought up in interviews), yet Paul Simon is almost universally applauded for collaborating with South African musicians and recording part of this album there. Did he collaborate or did he exploit them? He seems to have given co-writing credit wherever it’s due, but surely he seems to have become much, much richer – both financially and artistically – than them as a result. I’m not sure which side of the fence I sit, and I don’t really like to tarnish art with politics, but the whole thing reeks of a certain duplicity. What isn’t in doubt is whether this is a good album or not. I think it’s fantastic, and it’s a refreshing change from the sludge of mid-‘80s solo albums released by rock stars from the ‘70s. I’ve loved the album ever since I saw it covered during the first series of Classic Albums. It quickly became a favourite, throughout college and university, and I’d always try to push onto other people. If I had any criticisms at all, it would be the title of the song that lends its name to the album. Although it’s a fantastic song, and one of the album’s highlights, it just doesn’t fit right hearing about America, New York City and Elvis’ home when the rest of the album is so rooted in South Africa – both lyrically and musically. In the documentary Under African Skies, Simon recounts that it also didn’t make sense to him at the time, and that he always meant to the change the title of the song at least, but that no matter what he tried he just couldn’t change those words that fit so well. Perhaps it’s the counterpoint, between the subject matter of America and South Africa that actually makes it so interesting. A couple of years ago I went to see Simon & Garfunkel in concert. I don’t know what I was expecting but they totally exceeded my expectations, and to this day it remains one of the best gigs I’ve been to. Halfway through their set, Paul Simon walked offstage for a short break while Art Garfunkel remained on stage with the band. I started to lose interest after he followed a fantastic version of Bridge Over Troubled Water with a new song he had recently written. Right then, as my guard was down, and I thought I’d witnessed the peak of their performance with songs like Old Friends and The Sound Of Silence, Paul Simon walked back onstage to do his solo piece and give Garfunkel a short break. He walked out to the middle of stage and pointed across to the piano-accordionist that had suddenly appeared, who in turn started the opening notes to The Boy In The Bubble. I’d never have believed I would have seen Paul Simon perform this song, so it was a very happy and welcome surprise. 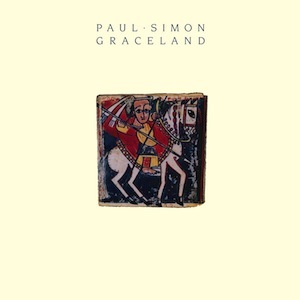 This entry was posted in 1986, Paul Simon, Queen, Simon And Garfunkel and tagged Art Garfunkel, Brian May, Classic Albums, Graceland, Simon And Garfunkel, South Africa, vinyl on August 27, 2012 by mrjohnnyandrews. I’ve always loved The Doobie Brothers because of Tom Johnston’s songwriting, but it wasn’t until I saw them live that I realised that Pat Simmons and his fingerpicking style is just as important to the band’s sound. Simmons’ fingerpicking is most notable on their later hit single Black Water, but it’s all over this album. The interplay between what he brings to the table, together with Johnston’s voice and second guitar, really is the sound of The Doobie Brothers. This debut is incredibly laid-back and it’s almost hard to believe that this band would go on to record some really big hits throughout the ‘70s. They almost sound too chilled-out to orchestrate anything as contrived as a pop single, and perhaps that’s more the influence of producer Ted Templeman than anything else. 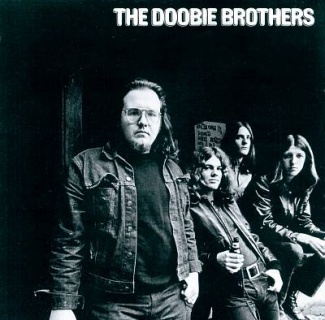 This entry was posted in 1971, The Doobie Brothers and tagged Patrick Simmons, Ted Templeman, Tom Johnston, vinyl on August 19, 2012 by mrjohnnyandrews.